This is an upgrade option which must be purchased with a belt. Cobra Buckle upgrades are not available for separate purchase or for Bargain Bin belts. If you would like to have a Cobra buckle of a specific color, this is where you can select it. Before you order, please make sure your belt doesn’t already come with the color you want. Wolf Grey and Coyote Brown come standard with the new Hardcoat anodized buckle. This is a matte bronze/grey color that looks amazing and does not chip like the powder coat versions. Black comes with Matt Black Anodized Buckle. Black Belts come with the Matte Black Anodized Cobra. All Black and Ranger Green belts come standard with a Black anodized buckle. 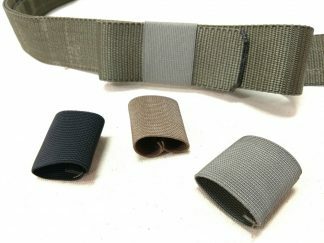 All Multicam and Coyote Brown Belts come with Elephant Grey powder coated buckles. Wolf Grey belts come with the Wolf Grey powder coated buckle. This is an upgrade item for a any of our Cobra belts and may not be purchased separately. Don’t be a dumbass and try to order this expecting a $5 Cobra Buckle. Warning! Once you customize a belt, we will not accept returns if it does not fit. To get a proper fit you must measure your actual waist around your belt loops. Pant size will not work. If you are using your belt with a padded belt, you must measure through the padded belt, on top of your normal pant belt.